Written by Catherine Saxelby on Thursday, 20 December 2018. With the rise of home delivered meal kits to cook in your kitchen, you’d be forgiven for thinking that was all there was. Not so. With Nourish’d meals, you get a hearty meal that's ready to eat as is or to heat in the microwave. Their motto is “Real food. Delivered” so with the help of tasters, we set out to find out if they hit the mark. This post has been sponsored by Nourish'd Meals. You can select meals to suit a low-carb diet style such as Keto-Friendly, Paleo-friendly or just Low-carb itself. In addition, there are options to exclude dairy and nuts if needed. There are six plans to choose from. The simplest is 5 meals (named unsurprisingly "A slice of Convenience"), delivered to your home or office, at the beginning of every week for $69.35 - an average of $13.87 per meal. However the price per meal is dependent on the number of meals and portion size you purchase as well as where you live, but ranges between $11.50 and $15. Pretty good considering all the work that goes on behind the scenes plus the fact that the ingredients cost more - all of the meat is grass fed and free-range (which is about 30 per cent more expensive than regular meat) and there are no cheap fillers such as pasta, rice or bread. This makes them more expensive than say a chilled meal from a supermarket at $7 or $8. Obviously the more meals you buy, the cheaper they get - with 10 meals a week coming in at $12.87 each and 15 meals at $11.93 each. Nourish’d deliver to most major cities and towns on Australia's east coast including Sydney, Melbourne, Brisbane, Gold Coast and Canberra. Nourish’d offer three sizes of meals – a 280g standard, a 400g large serve, and a 520g athlete serve. You just have to select which size you prefer. There is around $1 difference between each of them. We sampled a mix of all three. 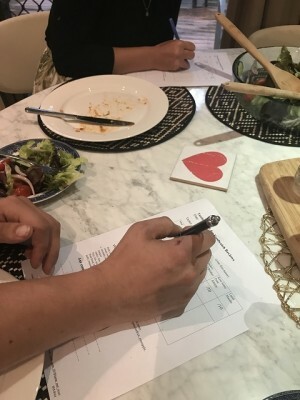 Approved for the NDIS (National Disability Insurance Scheme), Nourish’d is a handy option if you’re eligible for home services as they encourage independence. There’s no longer any need to have someone cook for you all the time. Simply pop a meal into your microwave, heat and you’re ready to go! More details and enquiry numbers on the website. We found the meals not as 'fresh' as a home-cooked dish but way better than other chilled meals that we’ve tasted. You still need to primp them a little e.g. scatter fresh coriander or parsley on top, or fork up the veges. If you serve the contents on a dinner plate (which we did except for the Breakfast and Salad) then you can fork them up then to improve eye appeal. Eating the meals did eliminate the need to wash up pots and pans at the end. Hooray! This was delicious except for the long sausage which lacked flavour. The scrambled eggs were home cooked, tomato was fresh, bacon was juicy, mushrooms had flavour. The grated mandolin of pumpkin was a welcome addition. Surprisingly this filled you up despite the lack of toast. Here the lettuce leaves were a tad disappointing as they were starting to go brown at the edges on a couple of pieces. But the bacon, chicken and cubes of sweet potato well and truly made up for it - there is heaps of chicken and sweet potato. Sadly, there was only half an egg – we would have liked another half. It needed the thickish Caesar dressing (supplied in a cute little tub which we used as a dipping sauce) as otherwise the ingredients were fairly dry. From the name, we expected this to be a vegetarian or meatless choice, not realising it contained beef mince and no pasta. Instead the mince sat on an interesting 'noodle' combo of sweet potato, zucchini and carrot which was nice. Maybe this shouldn’t be called “Spag Bol” as we all had distinct ideas of what should be in a Bol sauce. Perhaps it could be renamed Beef with Veges on Clear Noodles? We thought it a little watery, mostly we found the clear noodles weird with a strange texture (someone called them ‘gelatinous worms’). However, we welcomed the addition of the many veges (zucchini, carrot, sweet potato, onion) in the mince sauce. This scored nicely as the individual components were recognisable and different to what you get in other take-home ready-to-eat meals. Although a couple found it a little dry, overall everyone enjoyed the tenderness of the brisket slices, the crunch of the green kale-carrot-cabbage side, and the satisfying sweet potato ‘chips’. We wanted more of the Caveman BBQ sauce. This one was a winner. Sadly, the pork had that over-cooked, dryish texture which let this dish down but everyone enjoyed the chopped peanuts. There were heaps of broccoli florets – they looked a little grey as if overcooked but were not – they were crunchy as they should be. We liked the mild heat of the chilli in our mouths afterwards from the curry powder and cayenne pepper. Just enough! This was the clear winner and was liked by everyone. Perhaps because it came in two compartments – one holding the cauli rice, one holding the lamb. The lamb was tender, didn’t taste overcooked and teamed nicely over the ‘rice’ to make a solid meal. All these meals have little or no carbohydrate and contain no potato, rice, pasta, cous-cous or any grain. The Pumpkin Lasagne has no lasagne, for instance, but a layer of cauliflower mash (and a surprise of beef mince too). The Spag Bol also has no pasta but cunningly subs in sweet potato noodles along with some grated zucchini and carrot too. Despite this, you still end up eating an amount of carb (see table) but the serves were huge as we tasted some labelled Large or Athlete. The Keto Pork Satay had little carb – anything under 15 grams a serve is considered low. While I don’t agree with the no-carb approach, I understand the rationale behind these low-carb offerings and can see it in action here. You’d get a lot of vegetables from the meals. This replaces the carbs from white potato or rice but you still end up eating a lesser amount of carbs. Their sodium levels are all low range - 49 to 60mg per 100 g - except for the two meals with the bacon which came in at 300 and 362 mg per 100 gram. The key nutrient is protein. Lamb, broccoli, cauliflower, coconut cream, water, carrot, celery, brown onion, tomato paste, ghee, coconut oil, garlic, coriander, salt, pepper. Butternut pumpkin, beef, cauliflower, onion, tomato paste, coconut cream, oregano, tomato, free-range egg, ghee, basil, garlic, pepper, salt. You’d find all these ingredients at home. They are no additives that we can see so their claim of 'honest real ingredients' stacks up. They love coconut cream and coconut oil as well as ghee – and it shows. How much carbohydrate is in these meals? One slice of bread supplies 15 grams of carbohydrate and is the standard unit of measurement for most diets. These are uber-convenient. All you do is prick the clear top and microwave. That’s it. The delivery box is made from cardboard so can go into the Recycling bin. Inside the box, there are two sheets of insulation (see image) which is impressively made from KoolWool and did a top job in keeping the contents chilled until I got them into the fridge. There were two freezer packs in the box with the meals which I am happy to re-use. Plus, we got a pack of five protein balls from Thrive which were a welcome snack for in-betweens. Nourish's Meals are an easy and convenient way to eat your meals without any fuss. Who would these be suitable for? Hungry young men or anyone on a higher-protein way of eating for weight loss or bulking up. Or anyone who has no cooking skills and wants a quick, healthy meal fast after a workout at the gym. I’d keep my faves such as the Lamb Masala or Beef brisket on the delivery list. An easy and healthy way to fuel your day. For more details, visit www.nourishd.com.au. Thanks to our tasters Florence, Guy, Susie, Lauren, Maye, Dave and Georgia.